Antonio Villaraigosa, former mayor of Los Angeles who ran an unsuccessful bid for California governor, has landed at Mercury as co-chairman. 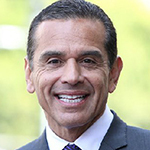 At the Omnicom unit, Villaraigosa will focus on strategic and crisis communications work. He’ll be based in LA. Villaraigosa wrapped up his second term in office in 2013. He chaired the 2012 Democratic National Convention, served as president of the US Conference of Mayors in 2011-2012 and did a stint on President Obama’s Transition Economic Advisory Board in 2008. Before becoming LA Mayor, Villaraigosa sat on the city council and was a member of the California State Assembly, where he rose to the Speaker position. Villaraigosa doesn’t plan to do any lobbying work for Mercury, which has a foreign client roster that includes Qatar, Turkey, Consulate of Japan, China’s Hikvision, Haiti and Cameroon.